Comics Impulse v2: Syracuse Heroes Expo Coming This Weekend! 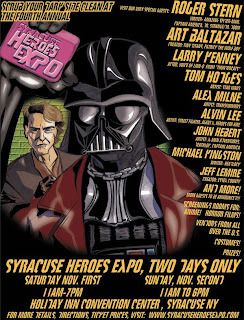 Syracuse Heroes Expo Coming This Weekend! The Syracuse Heroes Expo is Central New York's premiere hobby convention. From comics to action figures, anime, sci-fi, manga, action figures, and video games we are dedicated to bringing the very best enthusiast gathering to the CNY region! This year the expo is all weekend, so everyone is encouraged to come visit! This year's guests include Alvin Lee, Alex Milne, Larry Kenney, Tom Hodges, Art Baltazar, Jeff Lemire, John Herbert, Michael Kingston & Roger Stern. For more info, check the site! Tickets are on sale now!